This is a core final-quality integrator in the RIS system. It implements the forward path tracing algorithm, which excels in outdoor, highly specular scenes. The simplicity of the algorithm generally makes it easy to use and to implement. Shortcomings may include slow convergence speeds, especially for scenes with significant caustic illumination (see the clampLuminance and allowCaustics parameters, below, for more information). 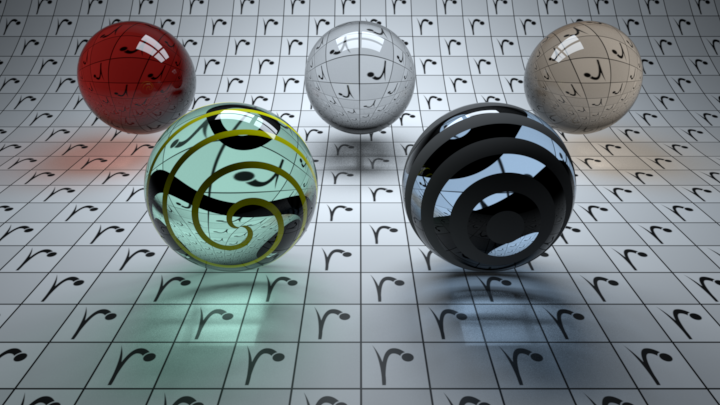 For direct illumination, PxrPathTracer looks at the values of the numLightSamples and numBxdfSamples parameters in order to determine the number of light vs. Bxdf direct illumination samples, and the resulting direct illumination contributions are combined using multiple importance sampling. For indirect illumination, PxrPathTracer, the sampleMode parameter controls the strategy for how indirect ray counts are apportioned between diffuse, glossy/specular, subsurface, and refraction/transmission Bxdf lobes. When the sampleMode parameter is set to a value of "bxdf" (the default value), then the number of indirect illumination rays spawned at each camera hit point is controlled by the value of the numIndirectSamples parameter, and the implementation of the Bxdf at each camera hit point controls the probability of generating indirect rays that are sampled from the diffuse vs. glossy vs. specular lobes of the Bxdf (or, in other words, the Bxdf controls how many indirect diffuse vs. glossy vs. specular rays are spawned at each of the camera hit points). When the sampleMode parameter is set to a value of "manual", then the value of the numIndirectSamples parameter is ignored and the user is responsible for manually controlling the total number of indirect rays per lobe of the Bxdf. Specifically, when sampleMode is set to "manual" then the numDiffuseSamples parameter explicitly controls the number of indirect diffuse rays that should be spawned at each camera hit point, the numSpecularSamples parameter controls the number of indirect glossy/specular rays that should be created at each camera hit point, the value of the numSubsurfaceSamples parameter is used to determine the number subsurface rays that are launched from each camera hit point, and the value of the numRefractionSamples parameter is equal to the number of refraction/transmission rays that are created at each camera hit point. The maxPathLength parameter is an absolute upper bound on the maximum ray depth for this integrator. The "trace:maxdiffusedepth" and "trace:maxspeculardepth" attributes control the maximum ray depths for indirect diffuse rays and indirect specular/glossy rays, respectively. Single scattering of volumes is supported in this integrator: any path through participating media will perform volume integration of the incoming light along that path. No new paths will be spawned from a volume (therefore no multiple scattering will occur for volumes). Controls the absolute upper bound on the maximum ray depth. A value of 1 for this parameter will allow direct illumination only, while a value of 4 will permit up to 3 bounces of global illumination. Default value is 10. Controls the strategy for how indirect ray counts are apportioned between diffuse vs. glossy vs. specular Bxdf lobes. Valid values for this parameter are: "bxdf" or "manual". If "sampleMode" is set to "bxdf", then the Bxdf is responsible for balancing the number of indirect rays that will be spawned at each camera hit point between the diffuse vs. glossy vs. specular lobes, and the total number of indirect rays spawned at each camera hit point will be controlled by the numIndirectSamples parameter. If "sampleMode" is set to "manual" the user is responsible for explicitly specifying the number of indirect rays to spawn per Bxdf lobe at each camera hit point via the numDiffuseSamples, numSpecularSamples, numSubsurfaceSamples, and numRefractionSamples parameters. The default is "bxdf". Controls the number of light samples for direct illumination per camera hit point. The default is 1. Controls the number of Bxdf samples for direct illumination per camera hit point. The default is 1. When sampleMode is set to Bxdf this parameter controls the total number of indirect rays to spawn per camera hit point. When sampleMode is set to manual the value of this parameter is ignored. The default is 1. When sampleMode is set to manual, controls the number of indirect diffuse reflection rays to spawn per camera hit point. Ignored when sampleMode is set to Bxdf. The default is 1. When sampleMode is set to manual, controls the number of indirect specular/glossy reflection rays to spawn per camera hit point. Ignored when sampleMode is set to Bxdf. The default is 1. When sampleMode is set to manual, controls the number of subsurface rays to spawn per camera hit point. Ignored when sampleMode is set to Bxdf. The default is 1. When sampleMode is set to manual, controls the number of refraction/transmission rays to spawn per camera hit point. Ignored when sampleMode is set to "bxdf". The default is 1. Controls the ray depth to begin performing Russian Roulette. The default is 4. Controls the path throughput threshold below which to begin performing Russian Roulette. The default is 0.2. If a value for the clampLuminance parameter is specified, then clampDepth controls the ray depth at which to begin clamping based on the per-ray luminance. For example, setting this parameter to 2 and also specifying a value of 4 for clampLuminance will ensure that the luminance of each ray's contribution is no more than 4 for all indirect illumination, without affecting or clamping the direct illumination. The default is 2. By default the PxrPathTracer integrator clamps the luminance of each per-ray contribution to be at most 10.0. However, it is possible to change this behavior by specifying a different value for the clampLuminance parameter. Specifying a relatively low value for the clampLuminance parameter (for example, between 2 and 20) can greatly speed up convergence and, in many cases, will make PxrPathTracer converge more quickly than the more sophisticated PxrVCM integrator. In some cases, indirect illumination lights paths may be noticeably dimmer due to clamping; this may be an acceptable trade-off in certain cases. Setting this parameter to a very large number (such as 1e30) will effectively disable all clamping. The default is 10.0. Controls whether illumination from caustic light paths (that is, specular illumination onto diffuse surfaces) is allowed or disallowed. The default is 0 (off). On top of regular LPE-based AOVs, this integrator ouptuts a number of standard AOVs typically used by compositors.